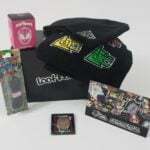 Check out all of our The Loaded Vault reviews the Men’s Subscription Box Directory! Each box comes with an information card that details the items in your box. Wood Bow Tie – Value $15? I was unable to find this exact bow tie on any site, so the value is estimated and based off simlars I was able to find. This bow tie, while being quirky and a definite conversation starter, is just a little too loud and not for my taste or style. If the tie didn’t have the mustache print, I would wear, but alas it doesn’t. The quality is nice and for the right person, this will be a great tie. I look forward to gifting this item! Wood Cufflinks – Value $10? I was also unable to find these exact cuff links, so my value is an estimate based of similar products I came across. I wasn’t a fan of the bow tie, but I like these much more and would wear them; they’re subtle while still being fun, and that’s something I look for in a cufflink! Overall quality is pretty good too. I’m excited to wear these to an upcoming event. Green Patterned Socks – Value $8? I again couldn’t find these online as there is no brand and they came unpackaged, so my value is an estimate. These socks are pretty soft and the quality isn’t the best (or worst) I’ve seen, but good enough and a nice addition to the box for me. I say you can never have enough socks! Green Pocket Square – Value $6? There was no packaging or brand label on this pocket square, so I was unable to find the product online or its value. I really enjoy this plaid pocket square; I love the color and simplicity of it. It’s also pretty versatile and will pair nicely with most dark colored jackets and the socks in this month’s shipment. Quality is nice and the material (I think cotton?) is quite soft, which I appreciate. Verdict: This was my first experience with The Loaded Vault and I was a little underwhelmed after seeing what was in previous months boxes. I was hoping for more everyday wear accessories like sunglasses, bracelets etc. Not giving up hope though, maybe next month will have products that are more my style and can be worn more frequently. The estimated value received is $39, which exceeds the cost paid, $19.99 (plus $3.99 shipping). A good deal overall if my estimates are accurate! What did you think about the products in this month’s shipment from The Loaded Vault? How do subscribers rate The Loaded Vault? Do you subscribe to The Loaded Vault? Add your rating now! The fact that you’ve pictured all mustaches upside down is killing me.